Danish police have detained a man injured by a small blast at a Copenhagen hotel amid media reports he was a would-be suicide bomber. He suffered slight injuries on his face and arms and was arrested in a park where he is believed to have fled after the blast at the Jorgensens Hotel. Police told the Associated Press news agency the blast had occurred in a toilet of the hotel. The hotel is located about 90m (90 yds) from a busy railway station. Police with sniffer dogs searched the park, Orstedsparken, and hotel, which was evacuated immediately after the explosion, Denmark's Politiken newspaper said on its website. 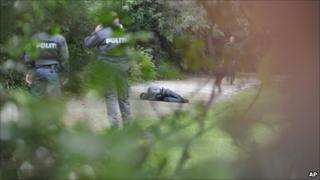 "We hope and believe that the person is the one who ran away from the hotel," police spokesman Moeller Jacobsen told AP. He would not confirm several media reports, which suggested that the arrested man had tried to blow himself up, nor would he give details of the suspect's nationality. The Jorgensens, described as a low-cost hotel, is located on Israel's Square, in the centre of the Danish capital. It is a short distance from Norreport Station.